I recently took a train to Munich from a tiny suburban station that only had a couple of ticket machines. At the time I was there one of the machines was broken, but I was able to get a ticket from the second one. But what is one supposed to do if all the machines at the current station are broken down or if there isn't one altogether? There weren't any MVV personnel at the station and the train I was taking (S-Bahn) likewise doesn't have any conductors selling tickets. To avoid an overly narrow question about S-Bahn trains in Munich, it would be nice to get a general answer about Germany as a whole. 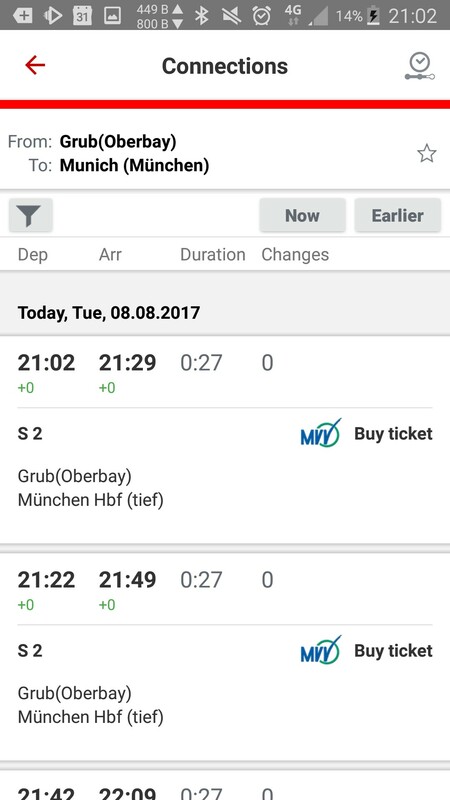 Deutsche Bahn has an app for Android, iOS and Windows called DB Navigator, and according to the official site, this app lets you buy tickets. It also features English language. Of course, DB cannot expect all travelers to have a smartphone to buy tickets on, and therefore the other answers here are completely valid. However, if you happen to have a smartphone with a data plan with you and simply want to buy a ticket, avoiding any explanations and/or hassle, purchasing a ticket through this app may be the simplest solution. I had this happen with the S-Bahn in Frankfurt and made 'official' enquiries about what sort of action the person should take (I like to play everything strictly by the book). By 'official' I mean I went to the station manager's office and asked the question to him point-blank. Predictably for Germany, there is a brochure that explains the procedure. Each ticket machine has a unique identifier, it's a number on a steel plate (or otherwise affixed) on the front or side. You take a sheet of paper and write down the number and the date/time and your destination. When (and if) challenged, you produce the sheet of paper. The revenue protection staff will know what to do after that and you will be off the hook (all other things being equal). End of story. I suppose that a mobile photo of the machine and a close up of the unique identifier will also do, but that's a pure guess. If possible, take a picture showing that it isn’t working. On each machine there is a number to contact in this event; call it if possible. Especially with smaller companies, you have to expect that the person answering will speak little or no English. In this case, consider asking locals to do this for you. If there are any locals suffering from the same problem as you, try to stick to them. This way you can benefit from them being familiar with the circumstances, the language, and similar. Also, the more people there are reporting the same problem, the more convincing you are. After entering the train, search for the conductor immediately. If there is none (e.g., on short-distance trains) wait and approach them directly if they enter the train. It is most important that you show clear intent to buy a ticket without being checked. In most cases (going by personal experience and stories of others), the conductor will sell you a ticket at the regular price. To this end it helps if the conductor is convinced that the machine is not working (here, steps 1–4 come into play). However, if the conductor isn’t convinced, they may charge you the increased fare for dodgers, which is usually 60 €. In most cases, you can reclaim this (again, the previous steps help), but it may be a rather tedious procedure for a traveller, particularly a foreign one. Also, prepare for major annoyances if you cannot pay this fare (remember that credit cards may not be accepted). All of this assumes that there is not a single working automatic or human vendor of tickets at the station. Note that in some cases, you may also find a ticket machine on the train. Anecdotal: A year or so ago I was trying to ride from Kleve to Duesseldorf on a Sunday morning. Machine was working but it didn't take Credit Card (only the omnipresent Eurocard in Germany), I was 50c short in change and small bills, wouldn't accept a 50 Euro note, and no stores were open to make change. Fortunately, there was a conductor when I boarded, so I just asked her what to do. I was more than willing to pay, but couldn't for technical reasons. In the end she let me ride for free. This also happened to me in Sweden a few weeks ago: Only one ticket machine at the station and it's broken. It affected quite a few people and the conductor was aware. The train made an extra long stop in the next larger station so everyone could shuffle out, line up at the machines there, buy a ticket and come back in again. tell him that you couldn't get a ticket because the machine was out of order! If you just make the mistake to take a sit and/or just wait that he comes to you and ask for the ticket then you will get fined with 60€ or double ticket price (whatever is higher). Note that this procedure will work no matter if you are tourist or citizen/permanent resident, the DB can not force anyone to use a smartphone app to purchase anything, (not even if you are a citizen/permanent resident, they just can not force you... ) in fact they have the obligation to have ticket terminals or desk points at EVERY train station no matter if that train station is just a hole behind the black-forest. If you're trying to board the last train somewhere in Kleinsiehstenich, Middle-of-Nowhere, and there either is no ticket vending machine or the one that is there is broken, you cannot possibly be expected to do anything else. The only things you must have is the means to pay for a ticket and the willingness to do so. You should maintain that willingness and eagerness until you have procured a ticket via any means offered to you. If there are no means being offered to you by the transportation authority, that's the best you can do. Now, this will work differently depending on where you're boarding the train. If you're boarding the train from a major train station in a major city without a valid ticket, you have probably missed a whole bunch of things you could have done before boarding the train. But if it's a rural area with literally nothing else around, I'd be very surprised to encounter a conductor who would even raise an eyebrow. "The basic rule is: buy VBB tickets before boarding the train. "Note: should there be no ticket vending machine or manned kiosk, buy your ticket in the train. Use the ticket vending machine inside the train for this, or immediately and unprompted contact the service staff, should there be no functioning machine in the train." Local companies may have different rules, but this should be the general idea. 1 You should have reasonable cash to pay for a ticket. For instance, if all you have is a 100€ bill, it may be unreasonable to expect to be able to pay for a ticket with this. Virtually no vending machine will accept it, and even drivers or conductors may be hard pressed. It's upon you to convert that to a more reasonable smaller bill in advance. 2 Say the machine inside the train doesn't accept whatever bill you offer it, say it can't give change for a 20€ bill at the moment. That could become a sticky situation if a ticket check occurs. I'd advise to first ask nearby passengers if anyone can exchange your bill for smaller ones. If not, maybe stick around the machine and try again later after some more people have put some coins into it. Display eagerness to obtain a ticket. You are expected to write down the selling machine's number or take a photo with your cell phone. This is in case you are being controlled, so you will only buy a ticket for 2-3 Euros rather than being fined 60 Euros. You are however also expected to actively contact personnel and tell them about it, and if there is none, you are to exit on the next station and buy your ticket there (though you will probably get away if you can just provide the broken machine number in case you're being controlled). You are kindly asked (but not required) to help DB by calling their 0800 number and informing them. The number is found on every selling machine. I was born in Munich and my grandmother still lives there, I go to Munich regularly to see her. Municians, in particular MVV personnel have a reputation of being slightly less than friendly towards foreigners (which includes non-Bavarian Germans). I can personally not confirm this. I cannot even say anything bad about Munichian bus drivers who have an extra bad reputation about being unkind ruffians. The MVV ticket system is sheer horror. Single fares are so expensive that they almost make you faint, so most people who need more than one fare (or who are in a small group) use the Streifenkarte (costs 12.50€ if I recall correctly, might be 13€ now). A defunct selling machine would therefore usually be not such an issue since you already have your ticket in your pocket. This kind of ticket is cheaper and very flexible, it can be used by a single person for several trips over one or several zones, or by multiple people for one or multiple trips. Now, buying the Streifenkarte is already a bit of a challenge to a foreigner, but using it correctly is yet another dimension of joy. It involves counting the number of zones, or hops, or both. And sure enough, the number of hops allowed for a short-trip (1 tick) is different using the Tram or the U-Bahn. Be sure you have someone show you, and be sure to look on the plan every time. And pay attention which way around you put it into the validator stamp. The system of folding the Streifenkarte correctly is so complicated that unless you have some practice and pay much attention, you are likely to do it wrong (either having no valid ticket, or paying a full trip when a short trip would suffice, or invalidating the whole thing). My father, who is (obviously) a couple of years older than me has accidentially invalidated the whole ticket more than once. On the other hand side... I have never been controlled in Munich. Never, not once. So, the risk of being caught with a wrongly stamped ticket seems to be rather low. If you are planning a trip which involves more than 3-4 fares within Munich, or more than a single person, or pretty much every trip outside the city limits, then the Bayern Ticket may be a valid option, and quite possibly the best. You can only get it at selling bureaus (DB, but the MVV bureaus sell it as well). This ticket costs you 25 Euros (used to be 15€ ?!) for the first person, plus 6€ for every additional person up to 5 people. It's valid for 24 hours, and you can go everywhere you want, not just within Munich but within Bavaria, any number of trips. Stations in Germany exist that do not have a ticket machine or any other means of acquiring a ticket. These are typically very small very unimportant stations on tiny rural branch lines, for example the station of Grafenaschau between Oberammergau and Murnau. In this case, the expected procedure is (assuming you want to go from Grafenaschau to Munich) to board a train bound for Murnau, get off there, buy a ticket at the machine to Munich and then take the next train onwards. Since you only have a few minutes to change in Murnau, you may likely miss the next train to Munich and have to wait there for an hour. This is reflected by the fact that the price for a ticket from Munich to Grafenaschau is the same as one from Munich to Murnau. Furthermore, especially in long-distance trains the conductors may even still be selling tickets on board. 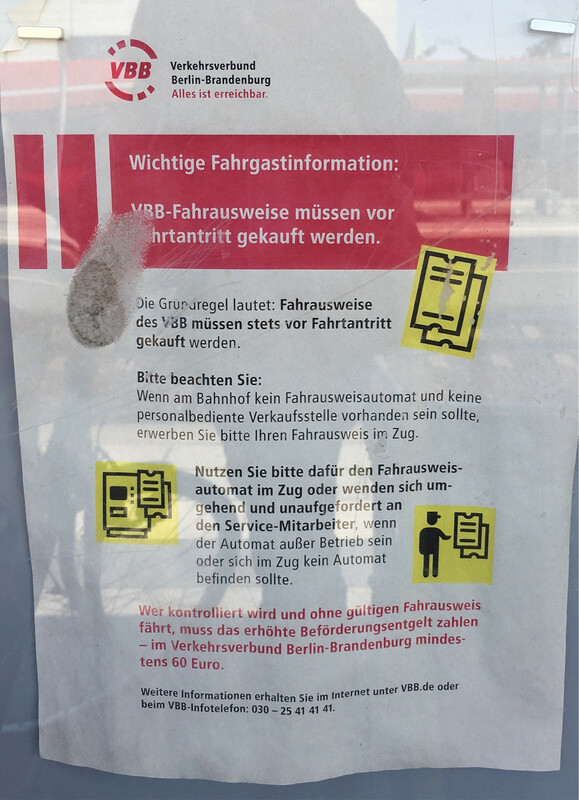 If you are on one of those trains you can just buy a ticket normally from them — be aware though that it may include a Bordpreis surcharge for buying on-board. However, since long-distance trains typically do not call in stations with the risk of all ticket machines being broken (aside from a total blackout, in which case the train most likely won’t be able to run either), this does not really help in the scenario presented. Finally, just to reecho the standard advice given: should all else fail look for the conductor on board, say that you wanted to buy but the machines were broken, ask if you can buy a ticket immediately and you’re good unless the conductor has a very bad day (in which case you can challenge his decision). Pictures work best. I've been on the trains in Berlin and the ticket collectors are rather forgiving. Also keep in mind that you might not even run into a ticket collector; I've had this happen many times on the trains.